Nothing is known of Gnaeus Silvius Amandus (285-286AD) other than three surviving coins one of which was in the collection of Sir Arthur Evans according to Roman Imperial Coins (RIC). We do not find Amandus listed among the 30 Tyrants of the Historia Augusta and as such, this person remains a mystery. What little we do know is that he was a leader of the Bagaudae (Bacaudae), which was a Celtic name in origin and appears to have meant “the warriors.” They were a group of oppressed Gaulish/Celtic peasants mixed with army deserters who apparently banded together and turned to pillaging Roman settlements while Carinus (283-285AD) and Diocletian (284-305AD) were occupied with their own struggle in the Balkans for the leadership of the Empire. While this group was raiding Roman settlement in Gaul, they apparently hailed two of their chieftains, Amandus and Aelianus, as emperors. 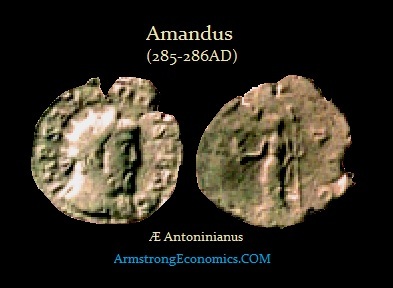 There are no surviving coins of Aelianus but there is of Amandus. After Diocletian was victories and further consolidated his power, he sent Maximian (286-305AD) west to end the pillage of Amandus. Upon arrival, Maximian enlisted the assistance of the naval commander Carausius (287-293AD) and was able swiftly to crush the outlaws. It does appear that they turned to pillaging Roman settlements given the inflation and decline in the Roman monetary system. As a consequence of this campaign, Maximian was raised to the rank of Augustus on April 1st, 286AD, and entrusted Carausius with the supreme command of the Channel Fleet and the task of ridding the western coasts of Frankish and British pirates. As is related in his individual biography, Carausius soon carved out his own separatist Empire in Britain and coastal Gaul in 287AD.